Scroll down to see the full details of holidays / breaks. Bob Ross Landscape Painting Holiday. Our venue is the 3* Red Lea Hotel, Scarborough. Beautifully situated on the cliff tops of the South Shore with breathtaking sea views. Attending a Bob Ross painting holiday is the perfect way to experience 'The Joy Of Painting’. You will be taught the Bob Ross wet on wet oil painting technique, this will give you the confidence and inspiration to create beautiful paintings. Even if you have never painted before, with just a couple of brushes, several gorgeous colours and a few basic techniques you will soon learn to paint a whole range of exciting pictures from dramatic landscapes to serene seascapes. Our holidays are designed for your enjoyment, held in a relaxed and friendly atmosphere and suitable for all levels of painters from absolute beginner to advanced student. Your certified Bob Ross instructor will be Keith Fish CRI CRFI. With his many years teaching he will ensure you receive quality tuition from start to finish, the number of painting places is limited to ensure this. All materials and use of equipment is included in the holiday price and all painting projects will not have been previously taught in any of Keith’s workshops. We will complete one painting per day following a step by step technique on Tuesday, Wednesday and Thursday, all of which you will take home at the end of the holiday. To allow everyone to meet each other and go through the weeks itinerary we will be holding a friendly reception on Monday evening, with a complimentary drink. Keith also provides the opportunity, throughout the holiday, to purchase painting materials and frames for your beautiful pictures. Accommodation. All guest rooms offer en suite bathroom, tea & coffee making facilities, TV, hairdryer etc and lift to all floors. We are pleased to be able to offer a limited number of single rooms at NO single supplement to pay, please book early to avoid disappointment. There is ample free, on street, parking with a permit supplied by the hotel on arrival. 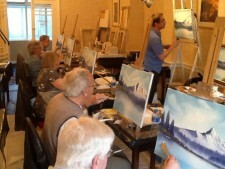 The price for painters is £489.00 per person, inclusive of accommodation, 3 course dinner, full English breakfast, 3 days tuition and all painting materials. 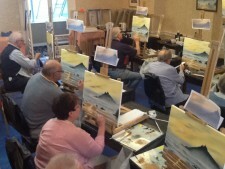 Non painting partners are also welcome at a special rate of £289.00 per person. A non refundable deposit of £100.00 per person is required to secure your booking. Full payment is required by 18th January 2019. The Red Lea Hotel enjoys a superb location, situated on the South Cliff in close proximity to the Cliff Lift, the Spa Centre, Italian Gardens and beach. The attractions of the town centre, historic castle and bustling harbour are only a short stroll away. At The Red Lea Hotel you will find comfortable, quality accommodation available in twin and single rooms. Together with large comfortable lounges and a well appointed restaurant renowned for it’s high quality Yorkshire fayre, your stay is sure to be an enjoyable one. 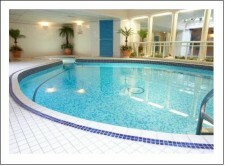 You can even take an early morning swim in the heated indoor pool. Full payment is required by 17th August 2019. Copying and reproducing of any graphics on this website is strictly prohibited.